Pericles is generally held to be minor Shakespeare. It was not included in the First Folio, has no reliable text, and was (according to almost all reputable scholars, who credit co-author George Wilkins) only partially written by the Bard. You never read it in school, and you only rarely get to see it. That is a pity, because – with some competent dramaturgy – it works wonderfully well in the theatre. 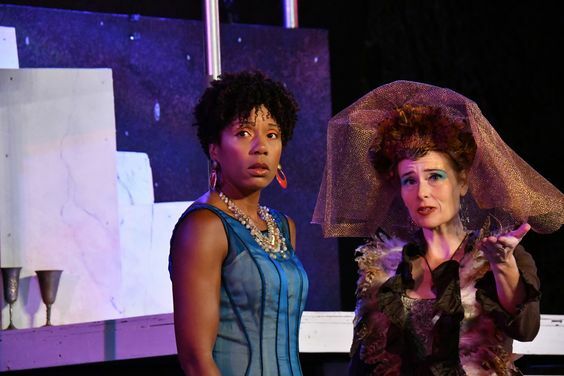 Exhibit A is a delightfully emotional/entertaining production at Marin Shakespeare directed by Lesley Schisgall Currier and starring Dameion Brown in the title role. 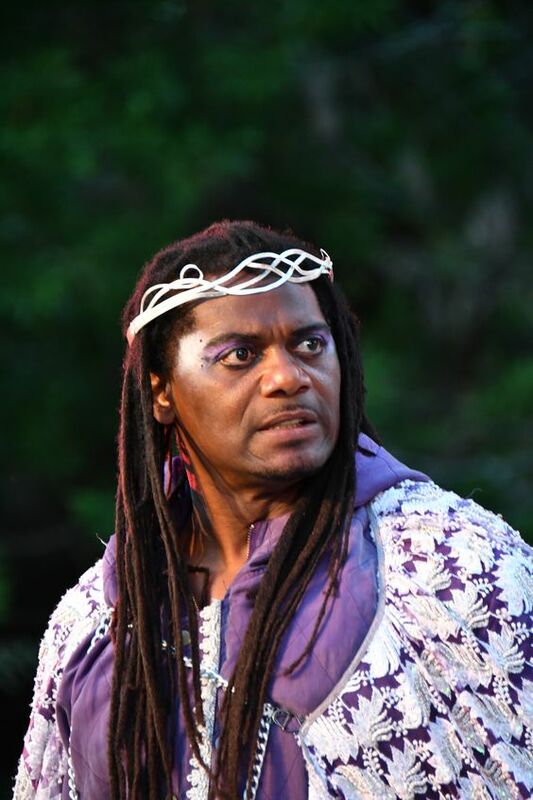 Dameion Brown playing Pericles. All photos by Jay Yamada, courtesy of Marin Shakespeare. Pericles is one of the late plays, collectively labeled the Romances, which are generically tragi-comedies. (The others are The Tempest, The Winter’s Tale and Cymbeline.) These plays veer into the darkest of tragic places including the dissolution of the protagonist’s sanity and the apparent deaths of all he holds dear before reversing course and miraculously ending happily. If you get the tone wrong, they can seem manipulative and melodramatic, but if you get it right – and Marin Shakes gets it exactly right – they are indescribably moving. Currier finds the perfect balance of humor, sentiment and mythos to unleash the play’s power. The play is too stuffed with incident to even attempt a plot summary, but this abundance of adventure, misfortune and eventual resolution is part of what makes it so alluring in the theatre. The action barely takes time to pause as Pericles’ epic journey races from one incident to the next, over decades and continents. The production uses a speaking ensemble of 10, many doubling and tripling roles in virtuosic turns. There is a not a weak link to be found, but Kathryn Smith-McGlynn is especially radiant as Thaisa and brilliantly hysterical as her polar opposite, the Bawd. Elena Wright perfectly sets the tone of the night as a petulant daughter to Antiochus, and is later stunningly commanding as the doctor, Cerimon. 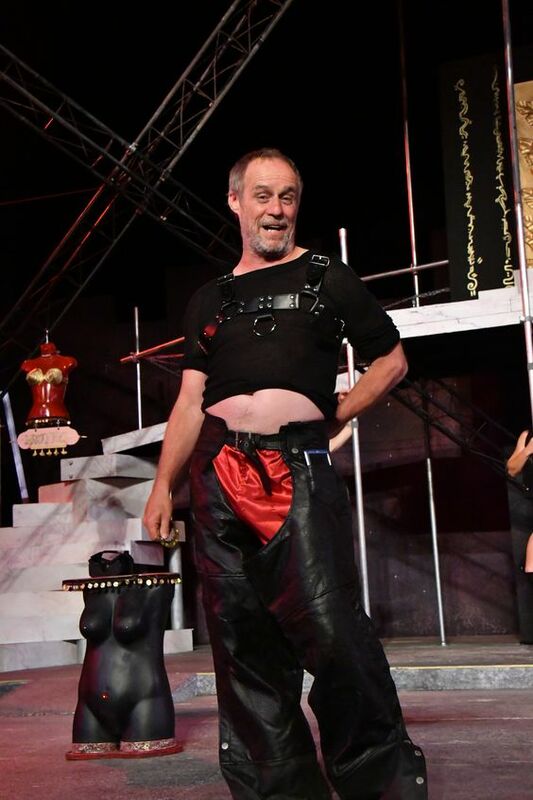 It is hard to image any actor finding greater range in roles than the exceptional Rod Gnapp does with the heroic and noble retainer Helicanus contrasted with the relentlessly randy jack-of-all-trades in the brothel, Boult. 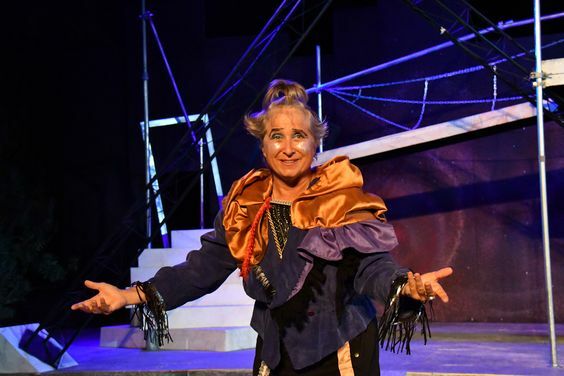 The entire production is moved briskly along by Diane Wasnak in the role of the narrator, Gower. This is a difficult, and often thankless, role, but she handled it with such clarity and precision that I looked forward to her every appearance. At the heart of the production is the relationship between Pericles and the daughter he gave up in infancy and believes to have died in her teens before they could be reunited. The daughter, Marina, is beautifully played by Eliza Boivin. Brown is powerfully emotional all night long, but at his best in the extraordinary scene he shares with her near the end of the play. Eliza Boivin as Marina with Dameion Brown as Pericles. Brown is a phenomenon all his own. A former inmate at Salano State Prison, he was discovered and trained by director Currier in their Shakespeare-in-prisons program. Upon his release, he made his professional debut as Othello for Marin Shakespeare, winning a number of best actor awards in the Bay Area. Knowing this history, it is hard not to see the emotional depth in his performance as a man who believes he has lost everything only to find redemption and second chances after decades of misfortune. 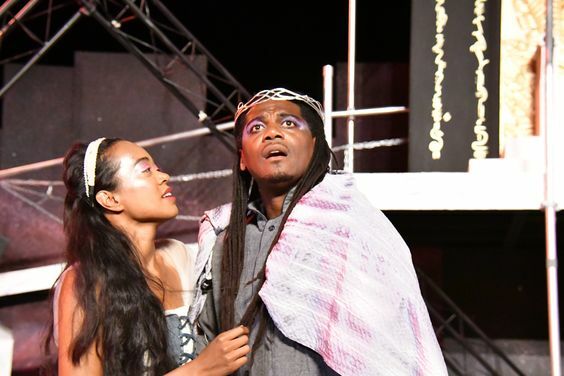 If you love Shakespeare, you’d be crazy to miss this performance, even if it had no other virtues than the realization of this beautiful scene. Of course, it does have other virtues, and lots of them! This company is not spectacle oriented but Jackson Currier’s set design is suggestive of the cosmic scale of the epic play. Merissa Mann, the costume designer, has the unenviable task of costuming this play that requires literally hundreds of costumes. Those most central to the production are wonderfully executed but, unfortunately, in the production’s only real downside, many of the costumes for minor characters and extras seem chosen for their ability to be changed quickly and neither look good nor fit. Joel Eis’ props, by contrast are comically perfect. The cast on Jackson Currier’s set. Performances at 8 pm Thursdays, Fridays, Saturdays and Sundays; and 4 pm Sundays. See website (www.marinshakespeare.org) for specific repertory performance schedule. 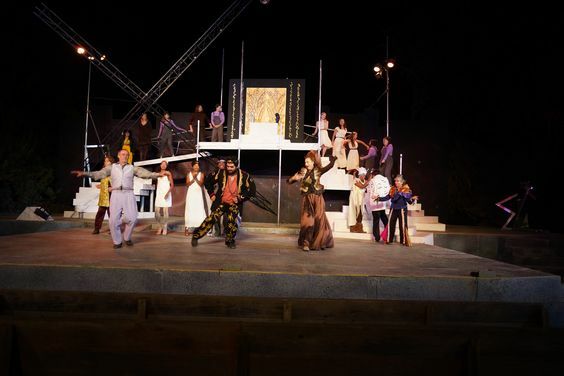 You are currently reading An Epic PERICLES at Marin Shakespeare at Shakespeare's Tribe.